TV | When Danny McBride donned a mullet to become Kenny Powers for HBO's Eastbound & Down, he forever changed television comedy. So you can't blame HBO for returning to see if there's any more gold to be mined from McBride and his collaborator Jody Hill's comedic vein. Thus, we now have VICE PRINCIPALS, which casts McBride as a sad-sack vice principal who dreams of someday becoming an actual principal of a school. When his boss (Bill Murray!) retires, McBride's Neal Gamby takes aim on the top job, and teams with cool guy Lee Russell (Walton Goggins) to oust the woman who's installed in the top job. It's not as well executed as Eastbound, at least not in its first two episodes, but I'm willing to stick around. SPORTS | This past weekend, one of the greatest baseball players to walk this earth was finally enshrined in the Baseball Hall of Fame. I recommend listening to the entirety of KEN GRIFFEY JR.'S HALL OF FAME ACCEPTANCE SPEECH; if you're a person of a certain age who grew up in the Northwest, you might get a little emotional. 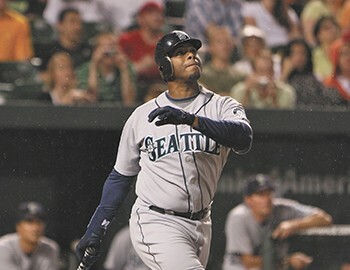 Griffey's waterworks began early in his remarks, which will bring you back to those heady days in the Kingdome where the Rainier beer flowed like water and Griffey launched dingers over the scoreboard with seemingly little effort. Find it on YouTube and hear the words of the man who changed baseball in Seattle.